This is the first Asado Picture I took. Basically Asado is the technique of cooking various meats. I look at it as an indoor barbeque. I had heard all of these wonderful things about Asado. Never did I picture in my head what I saw as I stood outside of this Parilla and watched the chefs working over a massive grill, perfecting their art as they intensely watched to make sure everything was cooked to perfection. This is an asado picture I took while attending the semana de criolla which is a popular Uruguay Festival that takes place at the Expo Prado in Montevideo. The festival goes on for a week and it is a large rodeo that attracts tourists, locals and numerous gauchos from throughout Uruguay and countries including Argentina. I attended on several days, and really enjoyed interacting with the people here. I found everyone to be very friendly and the gauchos were happy to pose for pictures. Although I study Spanish daily, I am still not fluent, but I found that when I made an effort to speak with the people at this festival in Uruguay that they appreciated my efforts and were happy to try and speak with me. I took several asado pictures but this one I think almost allows you to taste a true Uruguay Asado. Asado is a form of cooking Beef, it always includeds the rib bones and has lots of fat, so if you are a picky eater than be prepared to do some carving to get to the meat. 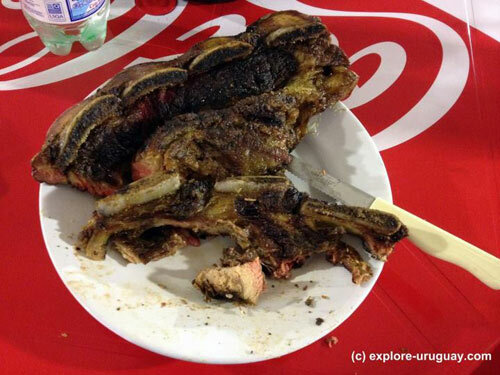 Also, if you like your barbeque well done, then you will want to explain this to the gauchos cooking your asado. I found that most of the time the meat was cooked medium rare, and although I like it this way, I understand that many people who are not accustomed to this prefer their meat to be cooked longer. The People of Uruguay certainly do love their barbeques and here is an Asado Recipe. Typically people in Uruguay all have a Uruguay barbeque at their homes. Every Parilla will also have one because without it, you could not call it a Parilla. When you Travel Uruguay I highly suggest you taste an asado at least once and see for yourself why this is a favourite food in Uruguay.